Tory Paxson, right, with Dr. Sylvia Whitlock. On International Women’s Day, 8 March, it is important to reflect on the milestones women have achieved in economic opportunity, and the role Rotary clubs can play. International Women’s Day, 8 March, celebrates women and their social, economic, political, and cultural achievements around the world. This year’s campaign asks individuals to #BeBoldForChange in working for a more gender inclusive world. RI President-elect Ian H.S. Riseley has also called upon Rotary clubs to seek more diversity in their membership, including improving the gender balance. In his address to Rotary’s annual leadership training event in January, Riseley noted that 103 of the incoming 539 district governors are women. These are “leaders who will help Rotary connect with, and represent, and better service, all the members of all our communities,” says Riseley. Governors-elect Sandy Sava of District 5180 (California, USA) (left) and Dawn deFuria of District 7450 (Pennsylvania, USA) sat down to talk about the current and future state of women in Rotary. Women are mothers, sisters, daughters, wives, supporters, even a shoulder to cry on. Yet women still earn less than their male counterparts. In my field, women comprise maybe 12 percent of all financial advisers. Women need to feel there is a support group, a sisterhood, they can go to for help. What can we learn from inspiring Women of Action? Rotary is about service and fellowship. While some value fellowship the most, others place the emphasis on service as the defining characteristic of their Rotary experience. I tend to belong to the second group. I believe in the importance of thinking through the design of our service projects to ensure they have a lasting and measurable impact on those we are trying to help. Sue Paget on the go for Rotary Family Health Days. Based in Johannesburg, Sue Paget is one of the driving forces behind the Rotary Family Health Days in South Africa. She has been married to Trevor for 34 years and has three children. This is the last in a series of blog posts leading up to International Women’s Day 8 March. “Africa is a harsh reality – we see, hear, and live with suffering on a daily basis, most especially in our disadvantaged communities. And yet the people still shine through. 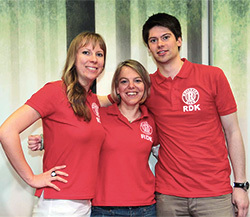 Doris Grimm (middle) and two fellow Rotaract leaders. By Doris Grimm, Rotaract representative District 1860 (Mannheim, Germany). This is the third in a series of blog posts about women making a difference in Rotary leading up to International Women’s Day 8 March. Teodora Lucero attends to the newborn at the evacuation center in Laguna as the mother rests. By Teodora Lucero, Rotary Club of Sta. Rosa Centro, Laguna, Philippines. This is the second in a series of blog posts about women making a difference in Rotary leading up to International Women’s Day 8 March. Editor’s Note: In celebration of International Women’s Day, which is 8 March, we are running a week-long series of blog posts from women who are making a difference in their communities and around the world through Rotary.